When I first started playing chess, it was by email to stay in touch with my dad and sister. I won both games, but my dad enjoyed it enough to continue in a 53 game match. He was a PhD in electrical engineering who had played in the Chicago Industrial Chess League when he worked for Bell Labs. He even got a win over FM Greg DeFotis. So, a loss to his son came as a challenge for him to solve. He refocused himself and won the next four games. I realized I needed to improve to beat him, but how? I had already started playing chess online at a free chess server during my four-game losing streak. It was like practice for me. I would try out different ideas online and see which ones worked for me. Then I could use the most successful ideas in my real games against my dad. It seemed to have an impact on my play. I pulled even in our match. However, I don’t think practice made me perfect, by any means. We were just a couple of chess players who had knocked the rust off. My dad hadn’t played seriously in a decade, as he picked up the hobby of cycling instead. While I had never played seriously, I did sharpen my claws a bit on Sargon III before going off to college. My next idea was to check out the local chess club. I met Dean Brown, an officer of the Colorado Springs Chess Club, who started me at a rating of 1500. I quickly bumped that up to 1700 playing at the club. It was an improvement over playing online, as the games were much slower. I had to learn to control my impulsive moves and look for better moves. I began to pull ahead in the email match but only slightly. However, learning to slow down only helped so much. Sure, I could eliminate a lot of blunders, but I wasn’t using that time to come up with a good plan. Here is an example of a game from the club days where I create for myself some problems in the opening, get back to an even game, but come up with a wild attack that only backfires on me. The Caro Kann was my pet opening from my online days. 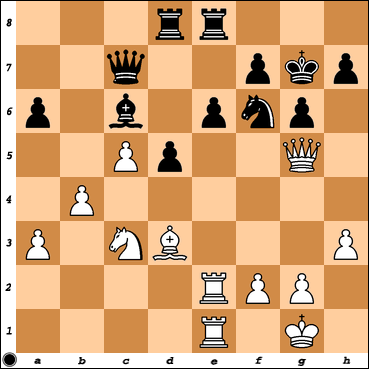 Here we get 7 moves into book, but I deviate with a strange knight move. I am not sure where he is going other than to block in the white bishop. I have gotten my white bishop out but at the expense of giving him a passed pawn. However, my dad has wasted some time with his bishop and seems to have let things get pretty even. Of course, I will quickly turn an even game into a massacre with a lot of short-sighted moves trying to create cheap tactics and push my center pawns too quickly that only end up dropping a ton of material. After seven years and 33 games, we were dead even. My dad started out a little better than me, drawing on his years of chess experience. However, I came up with a couple of ideas to even the playing field. Playing online for practice was a great way to get caught up on the experience advantage my dad had over me. And playing at the club was a great way to stretch my patience and learn to take my time looking over a position. Now I just needed something to pull my chess game ahead of my dad. While I was out of ideas about how to improve my chess, a fateful encounter with a chess master would provide the source for my leap in understanding. Practice – play as much as you can. Online servers can be a great tool. Patience – find time to use slow games to test your results. A club or tournaments that keep ratings can help you track improvements. 1. e4 c6 2. d4 d5 3. exd5 cxd5 4. c4 Nf6 5. Nc3 e6 6.
c5 Be7 7. Nf3 Nbd7 8. Bd3 O-O 9. b4 Re8 10. O-O a6 11. Bc2 Bf8 12. Re1 g6 13. 20. Bxg7 Kxg7 21. Bb3 Qc7 22. Re2 Nf6 23. Rae1 Rad8 24. Bc2 Bc6 25. Qe3 Nd7 26. 33. Qg4 Qg6 34. Nd6 Rxd6 35. cxd6 e5 36. d7 Rd8 37. Qe6 Bf3 38. Qe7+ Kh6 39.